Asking a commercial bank for a loan can be an intimidating, time consuming and difficult experience. Banks often get pitched by young companies that have no demonstrated market (not even a wait-list of customers), no beta-tested product prototype, and no proven management structure. Most young companies can’t get a loan – not even from nonprofit lenders – because most banks won’t even consider deals with less than two years of profitable tax returns, let alone a company that has only losses to show for its start-up phase. Much of what banks look for is what common sense demands if you’re not a clairvoyant. How can anyone predict who will repay a loan in the future? It’s only by looking at track record, history, and projecting the future based on that history. That’s how conventional bank loans get made. 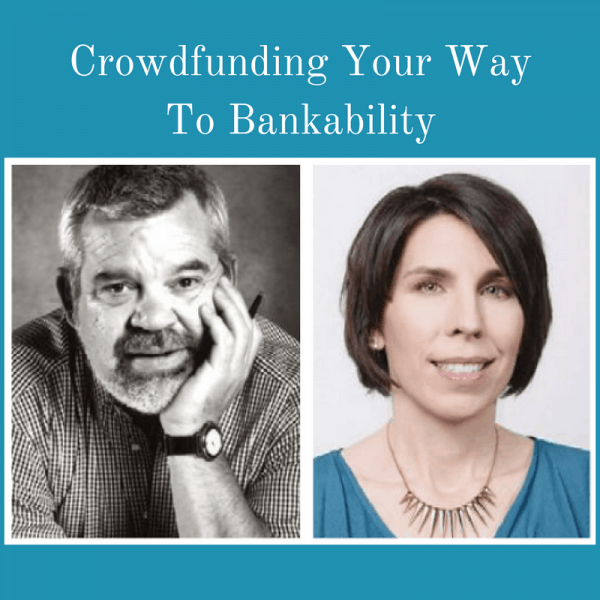 This history that can be found in either financial statements, the management team, the market acceptance, or, a new option that bankers are just beginning to understand – a successful crowdfunding campaign. Crowdfunding is the aggregation of small amounts of money from a large number of people primarily via the internet. 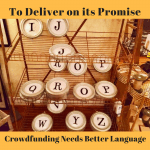 When crowdfunding, an individual or organization creates a ‘campaign’ on a public platform on the internet to request support in raising the funds needed for a specific project or purpose. Crowdfunding success is tied to the existence of a healthy network/customer base garnered via effective digital communications and social media marketing. The funds raised can be in the form of donations, rewards (non-equity), lending or equity. Most successful crowdfunding campaigns have nothing to do with raising equity capital or investment dollars – the overwhelming majority are what’s known as ‘rewards’ or non-equity crowdfunding. Examples might be pre-selling a new line of performance socks via a crowdfunding platform like Kickstarter or inviting customers to pre-buy $200 of GMO free, shredded Tofu product at a 10% discount provided a customer pre-pays with a credit card via a platform like Credibles. The virtues of this kind of crowdfunding campaign are not immediately clear to many until you start to understand what this does to address the banker’s concerns about funding into the unknown future. That the company has an online following and customer base – a result of a well compiled and maintained email contact list. That the company’s social media presence and brand name recognition can be translated into sales dollars. Who the company’s customer base is – analytics from Facebook and Google can readily identify customer demographics and proclivities. Bankers consider brand name recognition to be ‘goodwill,’ and ‘goodwill’ isn’t useful as collateral. It’s considered as ‘intangible.’ A successful non-equity crowdfunding campaign shows why goodwill isn’t intangible. It has real commercial value that can be translated into online sales dollars now and the financial support of loyal customers in the future. When crowdfunding, business owners do more than pre-sell their products and services, they nurture relationships with new and existing customers via digital communications creating open channels for customer feedback, and with it, brand loyalty. One good strategy for obtaining bank loan approval is to ask for loan approval that’s conditioned on the success of a crowdfunding campaign. The approval can state that no dollars from the bank will be disbursed until a pre-determined amount of funding is raised via a crowdfunding campaign – funding that can be verified via a public page on a crowdfunding platform website such as Kickstarter and by a deposit from the platform payment processor to the borrower’s bank account. Kathleen Minogue, Founder of Crowdfund Better, is a strategist, educator and speaker with a focus on utilizing crowdfunding to encourage entrepreneurship, economic development, and job creation in local communities, especially for women and minorities. Bruce Dobb is a partner of Concerned Capital, a boutique investment firm in downtown Los Angeles that helps businesses find government incentives, transition to new ownership and keep their jobs local.